Geek Girls Rule! Reviews "Sepiachord Passport Compilation" & Commends Veronique's Song! I need to start off this review by stating that I’ve known Mr. Bodewell, the curator of Sepiachord for a very long time. He is a good friend. I also know members of several of the bands on this compilation. But, as I’ve said before, if something doesn’t work, I’ll be honest about it. 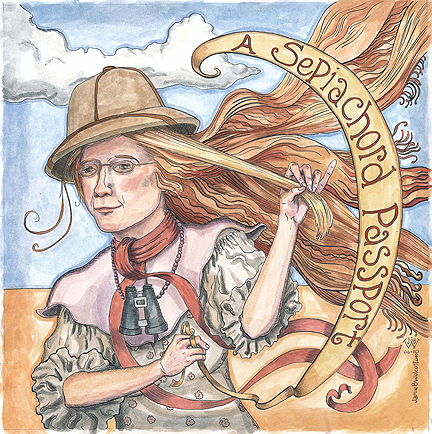 A Sepiachord Passport compilation CD. Now, I’m not a huge Steampunk fan. I enjoy the esthetic on others, but it’s not a style I favor for myself. However, much of the music on this CD touches the part of me that winds up humming, “Mein Herr” from Cabaret for months on end every time I see it. The tagline for the Sepiachord site is “Music for a Past that Never was.” Many of the songs on this compilation (and the other Sepiachord CD) have strong vaudevillian and cabaret influences. Jangly pianos and accordions feature strongly, as does the occasional theremin. Everything on this CD is more than listenable, but there are a few standouts. “The Dance Master” by Veronique Chevalier is hands down the best song on this CD. It tells the story of an evil Dance Master who seduces girls into a life of prostitution. She has a throaty voice, with a French accent. The first time I heard the song, I texted Mr. Bodewell immediately to tell him how incredible I thought it was. “Hollowland” by Blackbird Orchestra is also a great song, but it doesn’t fit. The others songs feature jangly vaudeville-sounding instruments, and Blackbird Orchestra has a very lush, full sound. Don’t get me wrong, I love the song! It reminds me a bit of Sisters of Mercy with some elements of the Killers thrown in. It’s fantastic, but I just don’t think it really fits. The majority of songs on this album tell stories, good ones, interesting stories, and with the exception of “Hollowland” they all fit together very well. They’re incredibly evocative, and I could probably give you a paragraph or more about each if pressed, but I’d like to go finish getting ready for PAX now. ETA: You can buy the Passport now on Projekt’s website.